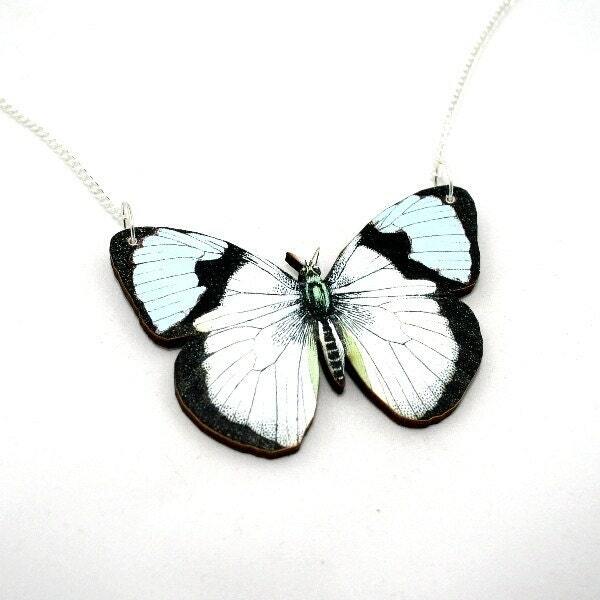 Blue and White Wooden Butterfly Illustration Pendant Necklace. This beautiful butterfly necklace has been made by adhering a blue and white butterfly image to 1/8” (3-4mm) thick wood board and then laser cutting to shape. The reverse of the butterfly pendant has been painted black. The pendant has then been added to an 18” (45cm) silver plated split chain. Having seen this style of pendant on several blogs I was really pleased to receive mine - it stands out beautifully and even looks quite realistic! Very well made, it was well packaged and dispatched very speedily. Thank you Laura, I love it!